Former world time trial championship runner up and ten-time Hungarian national TT champion Laszlo Bodrogi has boosted Team Type 1’s prospects of landing a Pro Continental licence, signing a deal to move to the team from Katusha. The 33 year old, who has also won stages in Paris-Nice, the Tour of Denmark and the Three Days of De Panne, will add strength and guidance to the American team, which wants to step up from Continental level. Team Type 1 Director Sportif Vassili Davidenko feels he will make a valuable input. “Bodrogi brings great world-class time trial experience to Team Type 1 and his presence is a remarkable addition to the squad,” he stated. CEO Phil Southerland agrees, believing that Team Type 1 can now chase big results at the start of stage races. “What the team has always lacked is a killer in the time trial, and now together with Bertogliati and Efimkin we now have the potential to show up at any event with a prologue and let Laszlo fly,” he reasoned. 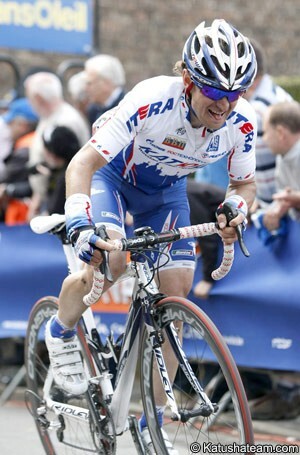 Bodrogi, who now races under a French licence, will be joined by the Italian rider Daniele Callegarin. The 28 year old has been competing with the CDC – Cavaliere team this year, and finished seventh in the 1.1-ranked Trofeo Matteotti. Last year he triumphed in the identically-ranked GP Industria & Artigianato and was third overall in the 2.1 Szlakiem Grodow Piastowskich. The team is planning to step up a level and while its application for a Pro Continental licence was delayed slightly due to slow bank movements, Southerland told VeloNation this week that he doesn’t anticipate any problems. The UCI also confirmed that the delay would not impact on the application. The goal of the team is to raise awareness of Type 1 diabetes, and several riders have the disease. The expansion for 2010 will see the team have an Italian base and a full European racing programme. In order to ensure it is competitive, it has made a number of big signings; other additions include Swiss time trial champion Rubens Bertogliati and the Russian climber Alexander Efimkin, as well as the Slovene Jure Kocjan and Italians Alessandro Bazzana and Andrea Grendene. The team plans to announce more signings in the days ahead.